The SkyDac Video Sensor provides remote sensing and reporting of optical events. It interfaces with the SkyDac base station via a secure 2.4 GHz ZigBee network. 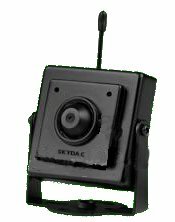 The SkyDac Video Sensor utilizes a tiny 640 X 480 resolution CMOS camera element to monitor video frames and detect real world event changes. The event detection may be zone based detection or via fuzzy pattern matching. What types of events can be monitored with the SkyDac Virtual Sensor? Contact Us to see how a Locus Logic SkyDac Video Sensor can be implemented to solve your monitoring application.